This installment of our short series on Luther Arkwright: Roleplaying Across the Parallels will look at the idea of an Arkwright-inspired campaign, and at the campaign support material drawn from the graphic novels by Bryan Talbot. These two graphic novels were each compiled from serials that spanned a great deal of time. The first collection, The Adventures of Luther Arkwright, began as a serial in 1978 which was ultimately and eventfully completed in 1989. A second series, Heart of Empire, was begun and completed in 1999. These are now available as a compilation entitled Arkwright Integral. Time, and the fortune of our position within its stream, makes it easy for us to obtain these works, where those whose minds were first set ablaze by them had to struggle to follow Luther’s exploits. In a way, that is one of the very things about which these works turn: Perspective and position in time. Arkwright, despite the temporal and dimensional shifts in its initial appearances, did not pass unnoticed. Inspiring writers such as Warren Ellis in his endeavors with Planetary, and drawing positive attention from his own inspirations, such as Michael Moorcock, Talbot sparked something in his audience which had the power of both the familiar and the strange at the same time. It cannot have been easy. That was my first thought when I considered running an Arkwright campaign – with or without the support of the superlative material presented by The Design Mechanism. This is fantastic stuff, and getting it right won’t be easy. What is an inspiring and ambitious series for an author and artist to create, can become so much more of a challenge for those who would emulate that inspiration and ambition, but do so by foregoing the confines of the page or the screen. Seeking out the interactive, unfettered, and ultimately collaborative medium of their roleplaying groups’ shared imagination, we hope to bring the worlds on the page to life in the minds of those gathered around our tables. Even with the unlimited budget of the imagination, some GMs can worry. The question of how one can measure up to work which has affected the audience enough to want to game in worlds like Talbot’s and leave their own mark upon them – if only in their own tales – can trouble some GMs. It may trouble some to the point of never trying to take on a challenge like this. It may not trouble others enough, with ego and/or lack of vision yielding predictably unspectacular results. The world of Luther Arkwright, at its core, is not one world. It is infinite worlds, each spinning on in their own way, each in need of our characters’ help. As gamers we are used to creating worlds, some for a night, others for decades of visitation. As gamers, we are used to our imagination being the loom on which dreams are spun into nearly-tactile tapestries with which we interact as a group. At the end of the session those tapestries of ephemera, decisions, and dice become mere memory, but we live on to tell those tales even if our characters do not, and the vistas of their homelands are just flights of fancy. This is what gaming is, really. License to dream in public and have those dreams supersede reality for a while, complete with participation from others. In Luther Arkwright, however, this concept is taken further. Few games have headed in this direction, and I might argue that few have done so with such support for the GM to create universe after universe of speculation, hope, or despair on quite this scale. In the Arkwright setting there are boundless parallel words, each its own complete universe, to which the characters might travel. Each of these has similarities to what we think of as the real world, but each diverges in ways alternately predictable and surprising; turning everything we potentially know about them into fantasy, or perhaps delusion. Every decision, every breaking point, every linchpin of consequences fair or foul can be found in all their permutations on one parallel or another. Winning or losing, laughing or crying, death or dismemberment, love or loss – each plays out in shades of complication beyond the simple dichotomy of one or the other. In each, to add more mystery and tension, things may differ simply because they do. In some, you might never have been born, while in others you may have been born as twins. Further stirring the pot of possibility and probability are the pawns and forces of the Disruptors. These are the opposition who seek out worlds they can tilt, alter, bend, fold, spindle, and mutilate so as to destabilize and distort what could happen in favor of outcomes that should not happen. These are the countless serpents despoiling the multiversal Garden in a dimensional and millennia-spanning struggle that perhaps even they do not comprehend – or care to. It is a war for reality, across realities known and unknown, recognized and unrecognized. How then do the authors of Luther Arkwright: Roleplaying Across the Parallels propose to turn such an expanse of possibility into the likelihood of running an actual game? We will get at the real core of that in the third installment of this series, but for now we will look at the three types of support material within this 180-page guide. The book opens with details to ground the reader on the book’s connections to RuneQuest 6th Edition, identify the source material for Arkwright, and spell out what it is that characters could most easily be conceived of doing within the Arkwright Setting. This section runs from page 4 to page 16 and can be said to be a solid overview of the scope of the book. If you read through this section, and do not know what a ‘typical’ Arkwright campaign might be like, or if you read it and are left cold, then it is likely that Arkwright is not for you. Even in such a case, the book is not without many, many uses. In order to do what it does, as we will discuss in the second and third installments, the rules expansions therein form the backbone of running RuneQuest in any modern era from the age of industrialization on up to star-spanning cultures, such as those in Star Wars, and beyond. The first level of support as I see it is writing which addresses understanding how to take on a campaign like this if you have never tried genre-blending to this degree, or are not certain how to do it at this scale. When the guidelines for character creation begin on page 17, the authors take the time to put the mechanics in the context of the campaign using direct examples of characters and situations. They then follow that up with short, descriptive, functional passages on the social, technological, psychological, and political elements of the setting before finishing with GM advice specific to undertaking a campaign in Arkwright’s multiverse. The second level of support is addressing the need for the group to be able to conceive of items, people, and places in the game, and represent them within the system. This can often be a chore in toolkit systems as the work is often done by reskinning or repurposing existing material and trying to make it all fit together. The GM in these cases needs to first identify the need for an item, then look for a match, then check for balance if they care for such things, and then finally introduce it into play and receive whatever response the players choose to give it. Luther Arkwright: Roleplaying Across the Parallels, takes the classic issue of imagining and implementing future and/or alien technology, and makes it simple. The book gives it a clear and quick process, and strips ambiguity and annoyance from this aspect of speculative world-building, leaving a solid foundation of invention behind. Finally, in gaming too often we get flowery words and scattered fiction which make us want to run a game, but in the end, leave us hanging in terms of practical support for doing so. Too often we find ourselves needing to just make things up, and scrabbling for context and example. Often readers can be left wondering what aspects of the implied themes and genre motivated the authors to go through all the effort of making a game. Too often, that practical material is simply absent from the book. Be it the curse of knowledge, or a lack of awareness that the game is an instructional document intended to empower the reader to run the game, some essential things can be lost in the translation of vision to text, or left out entirely. On both its primary and secondary levels, Luther Arkwright: Roleplaying Across the Parallels avoids this trap. Both as a means to support Arkwright roleplaying, and as a means to provide an expansive SF toolkit for RuneQuest 6, this book never fails to follow through on description with practical application and example. In fact, it goes so far as to make its frameworks explicit, and show you how to use them. In order, the book flows from its basic introduction, which includes a clear look at what is going on between the groups active in the setting, through character creation, and into those things which drive characters. This is done with tight, engaging writing and brings us up to page 48. We then step into a section which delves into madness and decline, which serves to underpin the following section on the game’s mental powers. This brings us to page 71 and essentially concludes the look at Arkwright roleplaying through the filter of the character. 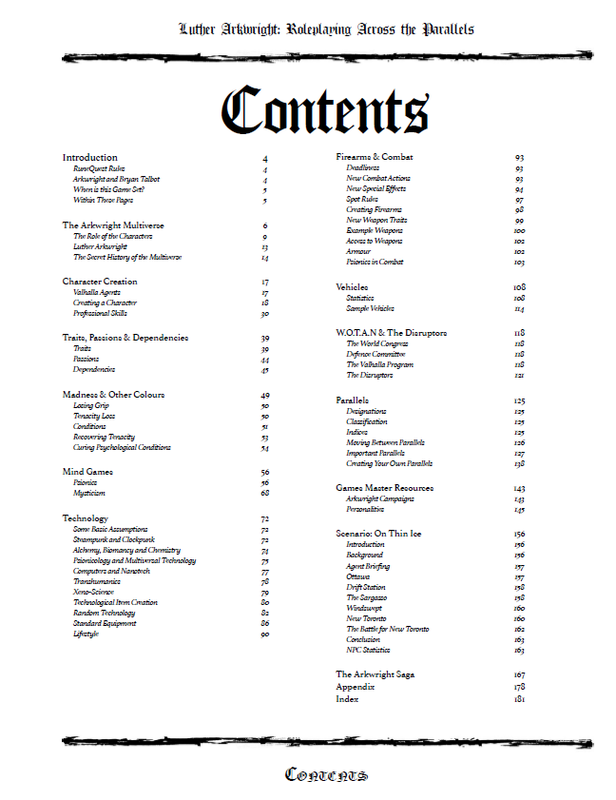 The filter of the setting’s tech and its genre element of invention and permutation are next and run from page 72 through page 92 and get us ready to face the modern combat expansion for RuneQuest. This section, taking on all forms of projectiles from ball and powder to blasters is mechanically in tune with the rest of the game, and rests comfortably on the same conceptual underpinnings. Combat is about killing the opponent, but can end up with their surrender…or horrible maiming. The technological filter continues through the firearms section and travels on with the vehicle section, demonstrating what sort of things might be possible in different parallels, and once again orienting the reader to understand that this is a game of a multiverse, filled with variation within practical limits defined by the human form. Once these foundation chapters are behind us, and we have bright images of Arkwright’s dark worlds firmly in mind, the book turns on page 118 to talking about the two main organizations represented in the graphic novels as being at war, the Valhalla Program and the Disruptors. This section gives shape to those on Parallels which follow, and lead us finally on page 143 to sane and extremely practical GM advice for running an Arkwright campaign which can counter all the fears and concerns given voice in the introductory paragraphs of this post. Not content to just give a few platitudes or talk about how cool it is going to be, the section lays out step by step instructions for how to frame a campaign in very practical language. If there is one thing in which Design Mechanism products excel, other than simply being excellent, it is in giving solid instruction on how to take an idea and make it into a reality within your game. The book ends with a short and dynamic scenario that runs from page 156 to page 163, followed by a complete rundown of the entire Arkwright Saga as presented in the graphic novels. While no substitute for reading them, it can help a GM keep a campaign in focus, find specific details quickly, and of course, offer inspiration galore. Great review looking forward to the rest.